Although based on the emails I receive it appears that technical traders are highly concerned about the differences that emerge from the choice of price series, i.e. whether they are adjusted for dividends and splits in the case of stocks or for rollovers in the case of futures, this will be the last post in this series because there is nothing inherently original there and solutions to these problems exist, they just require extra work. In this post I give a few more example about the impact of dividend adjustments on price series and how that may affect decisions based on technical analysis. I use the word “chaos” because it better describes a process where changes in initial conditions may affect large changes in the results. This is indeed the case with dividend adjusted data because when a drift is constantly introduced in a price series it changes the actual levels where in the past critical decisions were made. This is clear in the animation in Part I. Below I include examples from two of the most popular indicators used by technical analysts, the moving average and the RSI. The first example shows how the entry dates of a 50-200 golden cross change depending on the type of data series used and the second example shows that what appears as an overbought condition may not be one depending on price series used, i.e. whether it is adjusted for dividends or unadjusted. 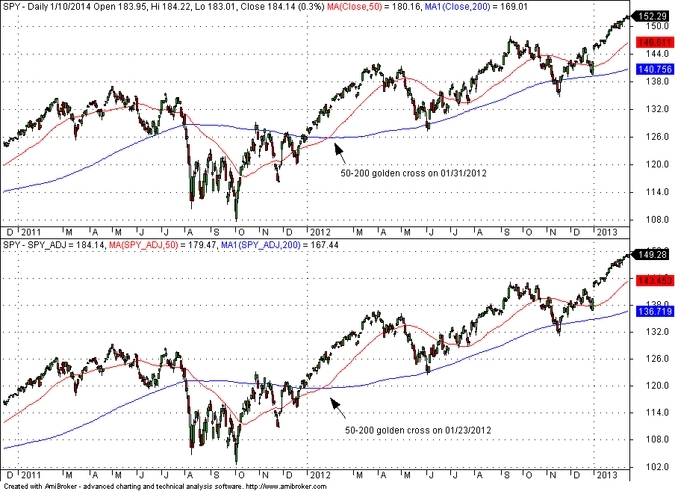 The top chart above shows unadjusted data of SPY and the last 50-200 golden cross entry that occurred on January 31, 2012. However, on the dividend adjusted price series on the bottom pane, the same golden cross occurs on January 23, 2012. This happens because of the drift introduced through the dividend adjustments. Apparently, two traders using the same indicator may obtain different results depending on price series used. For example, the profit factor may be different. In the above example, it is 3.26 for unadjusted data and 3.89 for adjusted, since SPY inception for a long/short 50-200 crossover fully invested system. 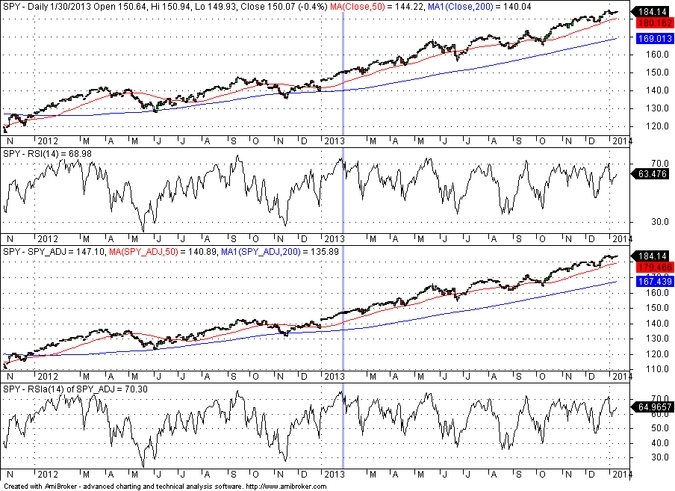 On the above chart the RSI(14) values for unadjusted (top) and adjusted (bottom) SPY daily data are shown. On January 30, 2013, for example, the RSI(14) on the unadjusted chart indicated that an overbought condition is no longer in effect whereas the same indicator on the adjusted chart indicated that the overbought condition persisted. Apparently, two technical traders using the same indicator but different data series may have made different decisions. What is the appropriate series to use? I think there is no simple answer to this question and it all depends on the objective. In my analysis I use both and compare the results. This requires extra work but nothing about trading is easy.